Silvano Bacci founded BACCI MARMI in Pietra Santa in 1960, right in the heart of Tuscany; since then the company has developed a range of specialist techniques for the production of marble, building on the fine art studied at the drawing table and the finely-honed skills of a time-served workforce. to understand how to enhance the colors and the surfaces and cleverly use the natural ability of stone to embody the heritage of the land and remain an essential, and ever faithful link to it. This development has allowed the company to incorporate aspects of local art heritage into its work. Nowadays, the Bacci Family puts its experience at the service of the company, combining the time-honored skills of master stonemasons and marble cutters with contemporary design and taste, to produce a wide range of materials and unique ways of working the stone. 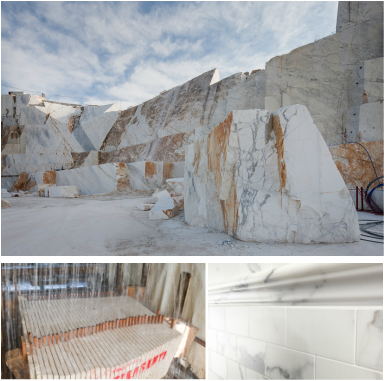 The company selects its own stone and marble from quarries, which is then transformed in a number of different stages. The marble is hewn into huge cubes then cut into block so that it can then be progressively reduced to slabs up to 3/8" thick; various different modular sizes can be produced as wll as special pieces which combine with them. The composition process, founded on a long tradition of craft techniques and an appreciation of fine art and decoration, ensures unique and exclusive shapes and colors in the inlay works and mosaics. The finishing process and combination of surfaces is based on the color, texture and grain, enhancing the natural consistency and stucture of the marble and stone. BERTI SISTO & C, Natural Stone Works, has been in the stone trade in the region for more than 30 years. 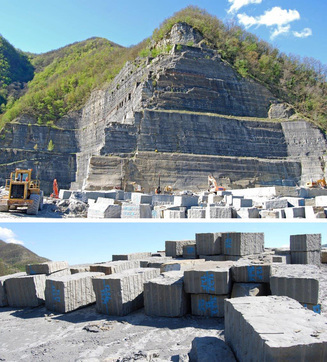 We are quarry owners, with 4 certified quarries, preferred for both dimensional and product quality of what extracted, located in the township of Firenzuola, near Florence in Tuscany, processing and providing blocks, slabs and finished products from slabs to tiles and cut to size items of the Classic Pietra Serena and the TUSCAN BLUESTONE from the specific Bucine quarry. With generations of Family lifetime experience in mining, extraction and processing of the stone with state of the art equipment through the complete production cycle to the finished product, we have fulfilled the expectations of worldwide clientele, most of them repeat clients for both residential and commercial projects. Our superior quality standards deliver a finished product that is ideal for a broad range of applications, aesthetically and mechanically correct. Be it paving of urban settings and roadways, cladding of buildings, historical and contemporary applications of many sorts, from residential to hospitality, BERTI SISTO BLUESTONE from the BUCINE quarry remains the pick of the A + D community since the Renaissance period, today and many more centuries to come, like YESTERDAY, TODAY AND TOMORROW. 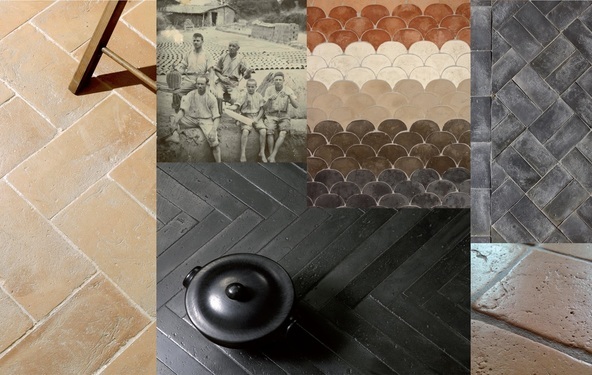 Welcome to the new face of SAITRAV’s stone world, one that embraces the most handsome range of classic Italian travertines in both tile and slab form. Galileo Dei and his Family have pursued a passion for this stone for generations and over the decades of successful expansion of the operation in Tivoli near Rome, the recent formal “opening” of the new Cream beige material from the Civita Castellana quarry, one hour drive north admits gorgeous hilly landscapes of vineyards and olive trees, has opened a whole new world of resources for what is considered without a doubt the most compact and beautiful replacement for Alabastrino and certainly Navona at a fraction of the cost. Simple elements, at the base of life, united by SUGARONI​ with the same techniques and passion since 1685. The FURNACE SUGARONI, the oldest in Italy, produces handmade terracotta tiles of the highest quality, more than three centuries with the same passion for craftsmanship and attention to detail. The products are 100% Made in Italy entirely designed, produced and packed in Italy. ​Each piece is individually produced, selected and controlled exclusively by hand in the tradition of craftsmanship.